Readers: For context, you can start by reading the Baptist Times article here, and then Hellen’s letter here. 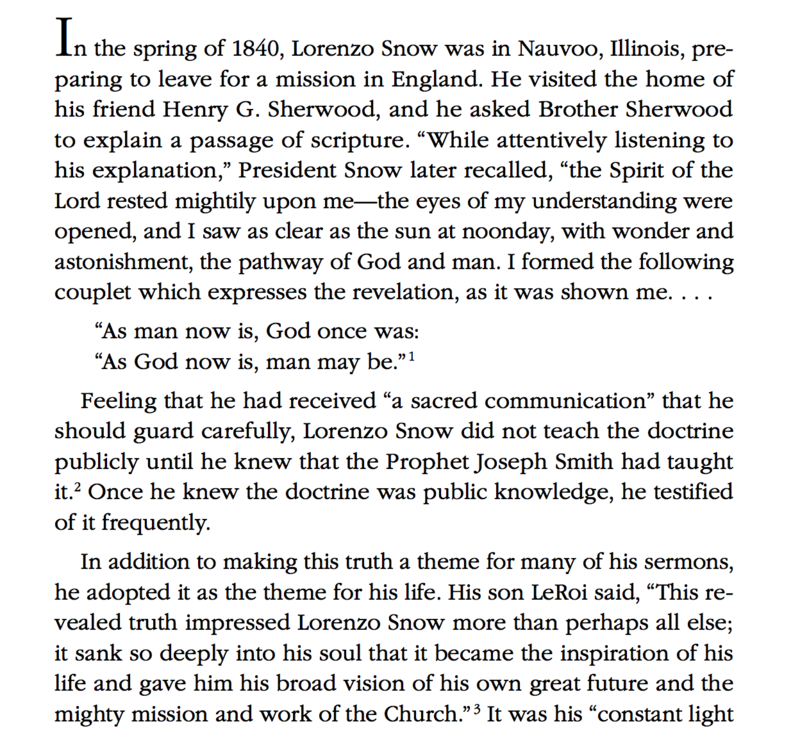 While I realize that there are a good number of Mormons who reject what their own leaders have taught, or at least mentally disassociate themselves from what their leaders have taught about fundamental things like the nature of God and forgiveness, it is still true that Mormonism continues to teach and perpetuate 1) Lorenzo Snow couplet theology and 2) that “after all we can do” means to fulfill a meritorious set of prerequisites for receiving forgiveness and eternal life. There are indeed some Mormons who reject the idea that God was once a mere mortal (not yet a God), and/or that we can become Gods (the kind worshiped by future spirit children), but this is the minority position, not the traditional, institutional, or mainstream Mormon position. So Bobby is absolutely right to generalize Mormonism as teaching it and Mormons as believing it. I ask thousands of Mormons whether they believe God was once perhaps a sinner, and about two-thirds of them answer in the affirmative. “Neo-orthodox” Mormons, and evangelicals who dialog with “neo-orthodox” Mormons, understandably desire to portray Mormonism in the best possible light, but it is best to give an accurate account of the state of affairs, recognizing both the perpetuated traditional position and the minority neo-orthodox position among Mormons. “However, grace cannot suffice without total effort on the part of the recipient. Hence the explanation, ‘It is by grace that we are saved, after all we can do’ (2 Ne. 25:23)” (p. 697). This has been the standard, institutional, mainstream Mormon interpretation of the passage since the late 1950’s. You can read for yourself a plethora of quotes by LDS leaders on this passage. The modern neo-orthodox Mormon reading of the passage, that “after all we can do” means “in spite of what we can or can not do, or what we have done”, is taught primarily by BYU professors like Stephen Robinson and Robert Millet, who are essentially trying to refute what the LDS prophets and apostles have been teaching for decades, albeit without explicitly calling attention to the errors of specific leaders. Should we stop openly and actively evangelizing Mormons, who generally hold to traditional Mormon positions, simply because minority positions exist among Mormons that are less heretical? Should we stop warning people about the errors of Mormonism, simply because a portion of them are less erroneous than the teachings of the traditional, institutional, and mainstream elements of the religion? Absolutely not. Portraying Mormonism in the best possible light — using almost exclusively the lens of LDS neo-orthodoxy — will win one more LDS fans, but it doesn’t help provide clarity and appropriate urgency that is fitting for those advancing the kingdom of God. Other problems with these changes are doctrinal, Despite what you think Saying eternal father verses son of the eternal father and verses like that, they are saying Jesus is God, vs Saying he is the son of God. This shows the trinity that Mike spoke of in Mormonism a while back. Then back in the 90’s when I would speak with Mormons, I read the Book Mormonism Shadow or reality, I would tell LDS about what I read, they would blow it off saying it cannot be trusted since it was not LDS approved and from so called enemies of the church. So I would them get photo copies of these issues from the Books listed and show the LDS these things. They would reply with, It’s only a photo copy and not the real book so they wont trust it. So I spent lots of money, I bought the entire set of JoD, I bought the original D and C with the lectures bound into them and an 1888 edition of the pearl of great price. Plus I bought other books, when I show LDS the books and problems, again more of the same, I dont know what I’m talking about, I’m a trouble maker Etc. It seems that what it comes down to is, No matter how much evidence we show, we will always be wrong, unless we simply believe then we are the smartest people on the planet. But as soon as they do their own research and understand Mormonism is false and see all these problems, then all of a sudden, they are stupid people who have no clue and are shunned. All the things I said to you in quotes are only some of the reasons these people and many others have left the church, they understand the problems. The Bible has thousands of years of History and as a result we have lots of overwhelming archaeological evidence for the Bible. I have mentioned this to Mormons before who admit this, but then say they dont have it for the BoM since it has only been around for a few hundred years at best. The problem with this is, People in the BoM are mentioned as living in Israel and the time line given is 600 BC, so this means we should have archaeological evidence since BoM people lived (supposedly) In Israel well over 2000 years ago. Then we have zero evidence of reformed Egyptian language ever existing, Yet this is supposedly what the BoM was translated from. Then I have been to Israel and will be going back in 2013 for 16 days, I have never been to BoM lands or meet people or have eaten the food. Yet I can say I did this with Israel. These are only a few problems and I know Shem, You dont care, you really believe the evidence is clear as can be and so you believe, Yet the evidence does not exist and thats why you need prophets to tell you, god spoke to them and said it does exist and they are real prophets despite all the contradictions among themselves. So you keep telling yourself it’s real, but so is the lake of fire thats coming. I am not sure, but I didn’t actually see a response to anything I said. So, maybe I should act like you and just say that you have no answer, and that is the reason you are not giving one. Yes, I did say you are just throwing things against the wall hoping something sticks, and you have done it once again. Do you really expect me to address everything you commented on. If so you’re crazy. However, since you insist on posting why we do or do not believe, let me give a few reasons of my own. First, I have the witness of the Holy Spirit, a member of the Godhood, whose witness is only for truth and cannot lie. Beyond this I need no witness, and anyone who does does not understand what it means to have faith. However, I do have further witness. I have the clear fulfillment of dozens of prophecies issued by Joseph Smith and others (I know you would argue the point). I have clear evidence of the Book of Mormon is the Archeology of the American Continents, despite peoples unfounded claims to the contrary. I have the witness of millions of the faithful who suffered persecution from those claiming to act in God’s name for their belief. I need nothing further. Truth is truth, and when God declares truth that is the end of debate. He has declared Joseph Smith to be his mouthpiece in restoring to the earth what wicked men drove from it. He has declared this church to be His church, and that in no other organization is found the fullness of the gospel, and thus no other organization has the ability to lead men to eternal life. These are truths, and I will proclaim them forever. Shem, The only witness you have is yourself. Your listing to your father the devil and your loving everything he tells you. I know you reject Gal 1:8-9. First you have the angel Nephi give JS the plates, then the and Moroni, cant you guys just pick a name and go with it? Then Supposedly JS translated the golden plates with a language that does not exist and no one can prove, yet you still believe it. Then the Jews alive today claim no evidence of Nephi or any BoM person ever lived or existed in Israel, yet according to the BoM they lived in Jerusalem, then all of JS prophecies have failed and thats why many members have left the church, yet you dont care, you find a way to claim they came to pass. I guess even though the Temple issue was supposed to be in that generation but that generation has been dead, all of them for years, but lets not worry about a generation that was told they will see it in their life time all dying and not seeing it, lets not be bothered with facts when feelings and desires are more important. Enjoy this life since the next one will be hell for you. You have no clue what witness I have, so stop trying to tell me you do. Of course, personal comments and attacks are all you have left, as your arguments are again falling short, and you still seem to be unable to answer any point that I made. So, until you actually answer my points I don’t think I will be posting again on this thread. Like you I have the witness of Jesus Christ and He tells me you are wrong. Wow, again were back to square one, so I guess we need evidence, yet you ignore evidence and just want a burning in the bosom and feel good about what you believe.